What a headline! 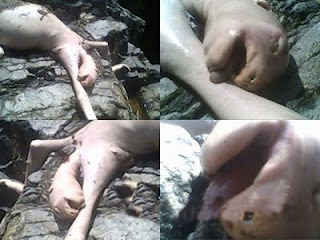 A group of teenagers encountered this strange creature on Saturday 12th September at a lake in Cerro Azul, Panama. 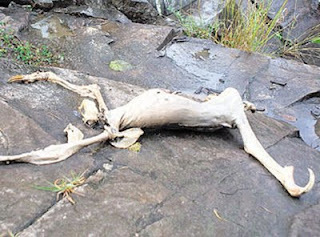 It (allegedly) emerged from a cave behind a waterfall and ran towards them as if to attack them. Being typically brave teenagers, they grabbed the nearest rocks that came to hand and stoned it to death ‘in order to defend themselves’ (that’s funny, UK teenagers use the same defence in order to ‘protect themselves’ from local pensioners in their own homes…). They killed it and threw it back into the lake, but clearly not before taking a set of photographs to flog to the local newspaper.